This stunning villa looks like its been plucked from the rolling hills of Tuscany with its terracotta roof tiles, hand cut stone detailing and stunning high ceilings that are all pulled together by an impressive central staircase. Nestled on the cliff tops of Portsea front beach, this home away from home features 6 bedrooms, stunning circular wine cellar/bar space and multiple dining and entertainment areas. Lights & Tracks worked closely with and coordinated all parties to design, specify and supply this very special custom home. 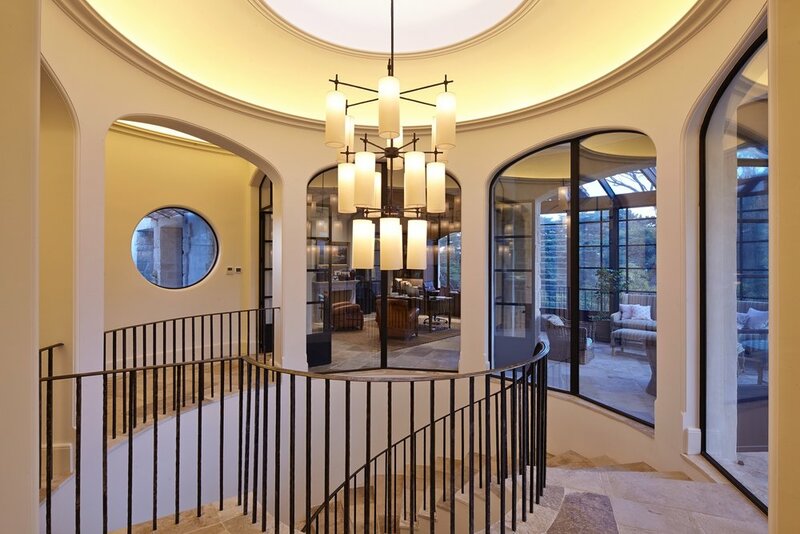 The central circular staircase is at the core of the home, connecting the living spaces. With multiple vaulted aspects, Lights & Tracks offered a lighting solution for this complicated space which provides an indirect light source without overpowering the beautiful handmade central pendant. Custom brass exterior lanterns were designed to not only provide a useful amount of night time ambience but also ensure an authentic integration into the exterior character of the building during daylight hours.